April & May Monthly Creations	There are 8 products. 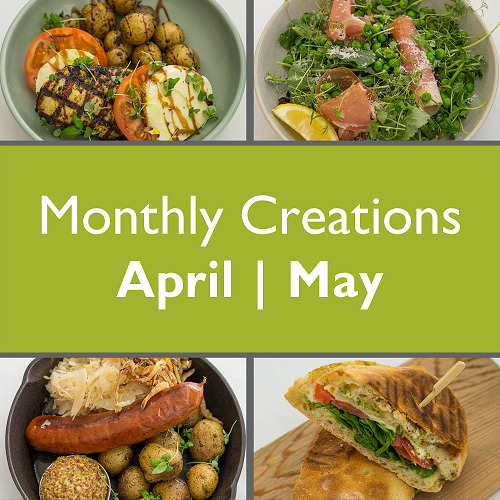 Monthly Creations is a special rotating menu of featured soups, sandwiches, chicken dishes, beef dishes, pasta dishes and desserts. We update our menus seasonally. THE ITEMS IN THIS CATEGORY ARE ONLY AVAILABLE FOR ORDERS DATED APRIL 1 - MAY 31. Monthly Creations | April | May | A nostalgic treat that harkens of summer pies cooling on the window sill. Bring that lovely fresh-baked smell to your event. All that’s missing is the long-roped swing. Monthly Creations | April | May | Lady finger cookie crumbs topped with marscapone cream and liqueur-infused dark chocolate. Monthly Creations | April | May | Slow-cooked sirloin with mushroom au jus on a soft Kaiser bun with baked beans and steamed vegetables. Monthly Creations | April | May | A fragrant dish made in one pan, so the sauce infuses the rice and meat. Tender bites of chicken breast, basmati rice, nutmeg, garlic and dried fruit. Served with naan bread. Gluten free excluding baked goods. Monthly Creations | April | May | A little taste of Naples can be had with this traditional dish made with tomatoes, olives, capers, anchovy paste, olive oil and garlic.